Christmas on a Sunday is always busy and there is a lot to consider when planning. On one hand there is no better place to be on Christmas morning than gathering for worship with your faith community. It is good to come together and celebrate the birth of Christ. It is also good to spend holiday time with family. Helping families have the time to come together and enjoy the kind of fellowship that we miss most of the year is extremely important. The leadership team at FBC wrestled with what to do for worship on Christmas morning. In the end we chose to have our normal worship service at 11am. We had an awesome weekend! 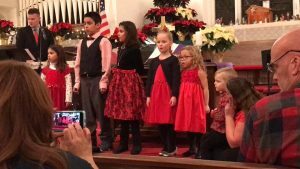 On Christmas Eve we had a wonderful service where the children shared some of the scripture they had memorized. We read the story of Christ’s birth from the scriptures. Owen Fresolone provided special music on the bagpipes! We closed the service in candlelight singing silent night. 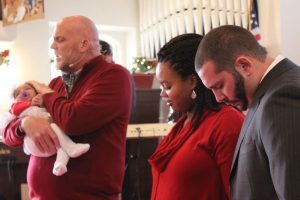 On Christmas morning our community gathered for an amazing time of fellowship and worship. 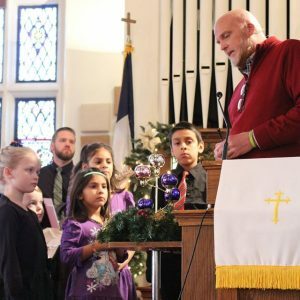 The children gathered that morning came forward and helped me light the Advent candles. We marked the four candles of Love, Joy, Peace and Hope. Together we lit the fourth and final candle, the Christ candle. It was a great way to start our Christmas worship. 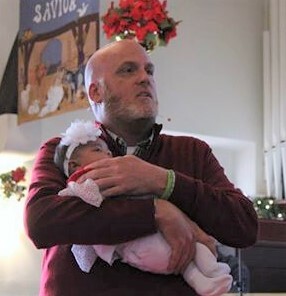 Tim and Cassandra McDonald brought their daughter Briella to be dedicated. We celebrated Briella’s birth. 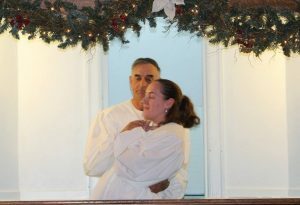 Prayed for Tim and Cassandra as they seek to raise in to love and pursue a deepening and growing relationship with God. Part of our tradition includes asking for those gathered to commit to help raise the child. We recognize that there will be moments when we can speak life into the lives of Tim, Cassandra, and Briella. We take that commitment seriously. Every child dedication is a reminder that we all have a role to play in helping each other grow in our relationship with Abba Father. A few moments later we were celebrating with Isaac Rose and Cora Goldberg as they were baptized. Baptism is a public profession of an inward faith. We celebrate Believer’s Baptism by Immersion. 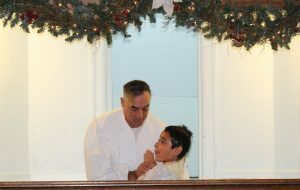 Candidates come for baptism once they are able to profess a belief in the person of Christ. Baptism is their public profession of faith in the person of Jesus Christ as Savior and Lord. Baptism is full of symbolism as we baptize by immersion. As someone goes under the water it symbolizes the death of Christ. It also symbolizes their commitment to die to their old self and live for Christ. Raising the person out of the water reminds us of Christ’s resurrection. It also points to the individuals commitment to live for Christ from that day forward. Go under the water an old creature…raise anew…transformed by the love and grace of God into a new creature. Worship was amazing. Owen played the bagpipes again. Our worship team led us in energized and heartfelt worship. All it all it was the perfect way to celebrate Christmas on Sunday! Driving home from worship Sunday morning I was filled with excitement. Our family was getting ready to have our Christmas celebration. It was the first Christmas with Mom and Dad living near us so there would be a dinner and time spent together.